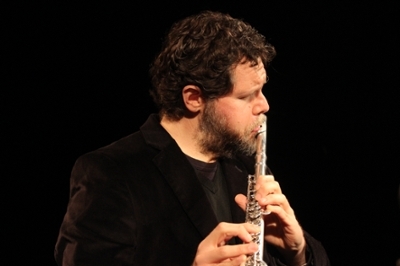 Wilfrido Terrazas (Camargo, 1974) is a Mexican flutist active since the early 1990s, whose career spans performance, commissioning, collaboration, improvisation, composition and pedagogy. His recent work has been focused on finding points of convergence between notated and improvised music, and in exploring innovative approaches to collaboration and collective creation. He is a founding member of the Mexico City-based improvisation collective Generación Espontánea since 2006. As an interpreter, Wilfrido has performed over 300 world premieres, and has been a member of Liminar ensemble since 2012. As a composer, his main interest is the exploration of dialogues between composition, improvisation and performance. As such, he has written over 40 works for diverse instrumental forces. Other current projects include Filera, Escudo (Torre), and the Wilfrido Terrazas Sea Quintet. Since 2014, Wilfrido has been co-curator of La Semana de Improvisación La Covacha, a week-long festival dedicated to improvised music in Ensenada. Wilfrido has been a committed educator since his adolescence. Prior to his appointment at UCSD, he taught at the Conservatorio de las Rosas in Morelia and at the Escuela Superior de Música in Mexico City. He is also in demand as a coach and workshop leader throughout Mexico. Wilfrido has given concerts and participated in projects in Argentina, Austria, Belgium, France, Germany, Greece, Italy, The Netherlands, Portugal, Spain, Sweden, United Kingdom, United States, Venezuela, and in over 40 cities in his native country. He has obtained support from the National Fund for the Arts and Culture of Mexico (FONCA) and several other Mexican institutions, has been an artist in residence at Omi International Arts Center, Atlantic Center for the Arts and Ionion Center for the Arts and Culture; and participated in the recording of more than 30 albums, three of them as a soloist: Open Cages (Umor, 2007), Bóreas (Shival/CONARTE 2010) and Bug/ge/d (Mandorla, 2010). Among his long time collaborators are composers Ignacio Baca Lobera, Thanos Chrysakis, Edgar Guzmán, Nickos Harizanos, Iván Naranjo, Mauricio Rodríguez and Carlos Sandoval; cellist Natalia Pérez Turner, vocalist Carmina Escobar, multimedia artist Yair López and poets Nuria Manzur and Ronnie Yates. Recent collaborations include recording with Roscoe Mitchell and playing with Andrew Drury, Vinny Golia, Stephanie Griffin, Katt Hernandez, Anne La Berge, Wade Matthews, Mary Oliver and Stephanie Richards. Wilfrido Terrazas studied music initially in Baja California and California. He later graduated from the Conservatorio de las Rosas. Among his most influential teachers are Damian Bursill-Hall, John Fonville, Roscoe Mitchell, Guillermo Portillo and Germán Romero.